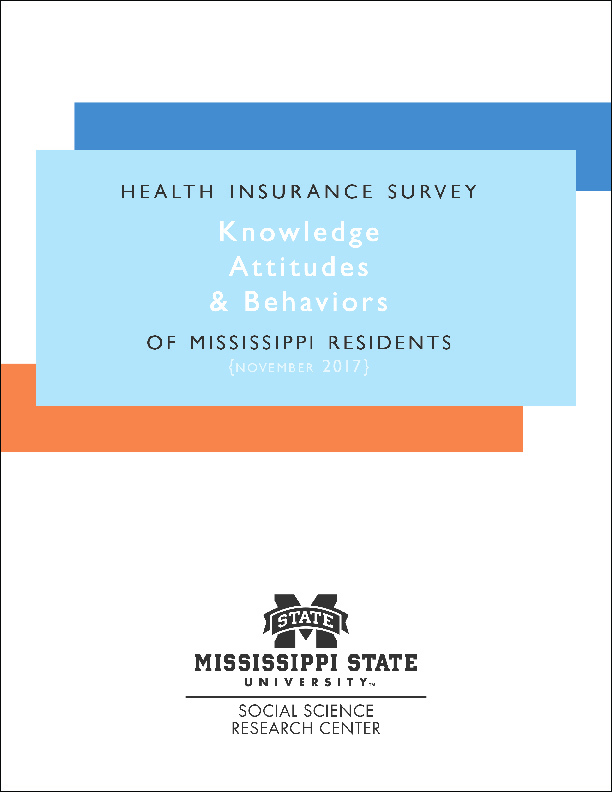 In 2017, the Center for Mississippi Health Policy commissioned researchers at the Social Science Research Center (SSRC) at Mississippi State University to survey non-elderly Mississippi adults to assess their knowledge, attitudes, and behaviors related to health insurance and the Affordable Care Act (ACA). This survey serves as a follow-up to similar studies conducted in 2013 and 2014-15. The Center has prepared an Issue Brief that summarizes the results of the 2017 survey and a Chartbook with a more detailed analysis of the data from the survey. A copy of the full SSRC Report containing all survey responses, as well as the survey methodology, is also available under Related Links. Approximately 16 percent of survey respondents reported not being currently covered by health insurance, a drop from 23 percent in 2013. 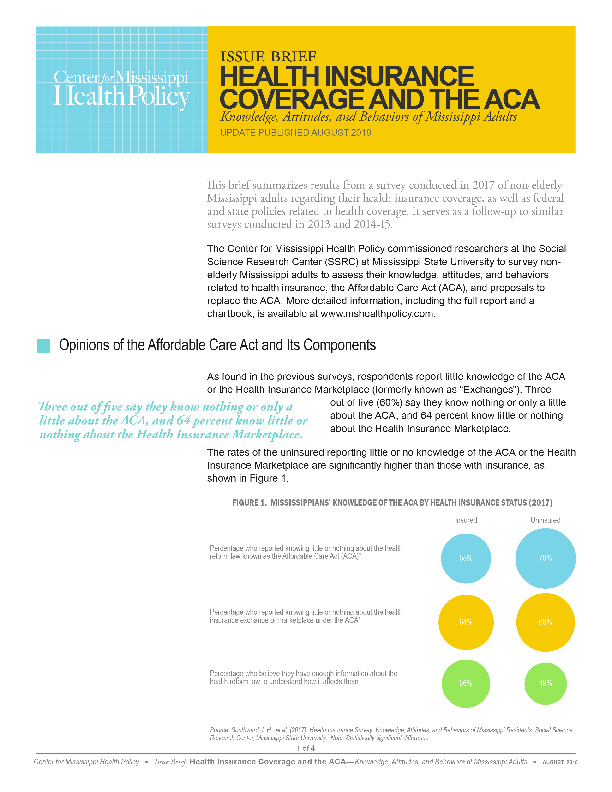 In a departure from previous surveys, more Mississippi adults expressed a positive opinion of the ACA than a negative one, with 47 percent supporting the law, 38 percent opposing the law, and 15 percent stating they were unsure. As in the previous surveys, respondents showed support for many of the components of the ACA, with the notable exception of the individual mandate penalty which has been repealed as of the end of 2018. While 40 percent forecasted in 2013 that they expected to be worse off as a result of the ACA, only 29 percent in 2017 said they were worse off due to the Act. Almost half (47%) said they were unaffected by the law. Most (62%) of those surveyed who did not have insurance had been uninsured for a year or more, and 43 percent had been uninsured for two or more years. Three out of five (60%) say they know little or nothing about the ACA, and 64 percent know little or nothing about the Health Insurance Marketplace. Similarly, less than half (45%) say they have enough information about the health reform law to understand how it will affect them or their families. The rates of the uninsured reporting little or no knowledge of the ACA or the Marketplace are significantly higher than those with insurance. Though the uninsured rate has dropped since 2013, sixteen percent of Mississippians are still uninsured, and uninsurance rates were higher for those with lower income levels. Of those with household incomes less than $10,000 per year, over half (56%) reported being uninsured. By far, the most common (45%) obstacle to having health insurance cited was cost. Uninsured respondents overwhelmingly perceive health insurance as something they need but were also significantly more likely to state that insurance is not worth the cost. Approximately a third of the uninsured reported that they tried to enroll in insurance coverage through the Health Insurance Marketplace. Of these respondents, most (52%) said they did not enroll because the plans in the Marketplace were too expensive. One strategy for making health insurance more affordable is to allow insurers to offer plans with high deductibles and co-pays or fewer benefits in order to lower premiums. 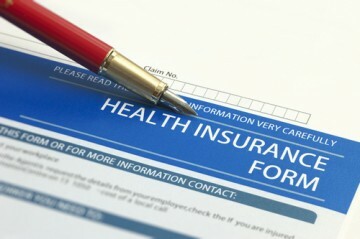 When asked if they would purchase such a plan, 77 percent of the uninsured said they would. When asked what amount they would be willing to pay per month for an “affordable” plan, more than half (55%) listed a price of $75 or less. The findings of this follow-up survey illustrate the changes in the attitudes, opinions, and behaviors of Mississippi adults since the initial survey in 2013. There continue to be low levels of knowledge about the Affordable Care Act and the Health Insurance Marketplace, particularly among uninsured adults in Mississippi. Although there was a significant increase in support of the ACA, less than half of adults favor the law overall. However, Mississippians strongly support many of the health reform components in the law, including subsidies for low-income individuals and Medicaid expansion. The percentage of Mississippi adults who report being uninsured has dropped since 2013, but cost is still the greatest barrier to their obtaining health insurance coverage. The uninsured overwhelmingly perceive value in health insurance coverage, although not to the extent of the insured, and are more likely to state that health insurance is not worth the cost. Without substantial subsidies, the price of basic health insurance coverage with reasonable cost-sharing far exceeds the amount people are willing to pay. For those with low-incomes, unaffordable private coverage and lack of access to premium assisted coverage through an employer, the Marketplace, Medicaid, or other source leave some with no other alternative than to remain uninsured. Copies of the Issue Brief can be downloaded HERE. Copies of the Chartbook can be downloaded HERE. Copies of the complete SSRC Report can be downloaded HERE. 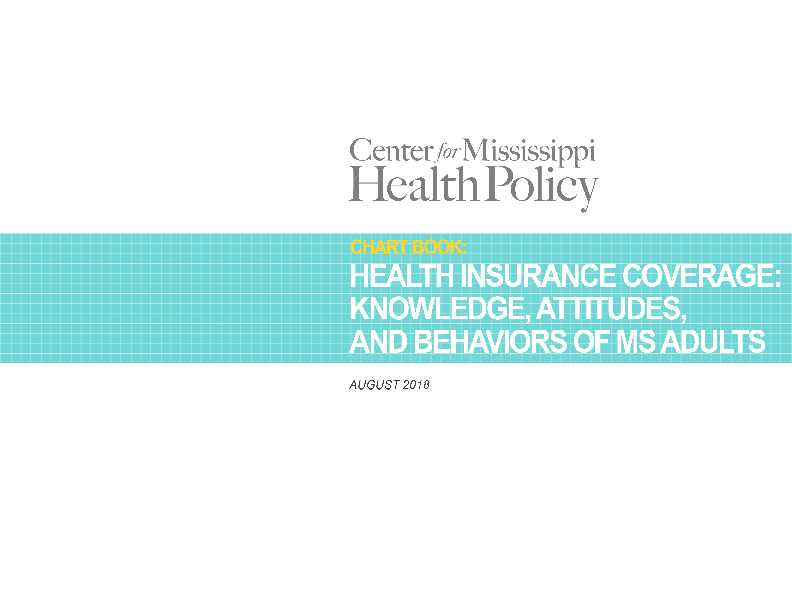 Printed copies of the Issue Brief are available by contacting the Center for Mississippi Health Policy at 601-709-2133 or by e-mail at info@mshealthpolicy.com.